Van's Views - Hair, Beauty, Nails & Lifestyle Blog: Its all for charity! Sorry for the lack of postings recently, I have been hard at work and hard at training. 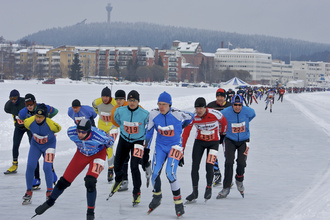 I have put myself up to skate a marathon on a frozen lake in Finland in three weeks time! Im raising money for our local hospice, The Prospect. Many of our clients and families have needed their help over the years and I thought that to do something challenging would be a way to raise funds and help them. My targets £500 and I am half way there. So its early 6am visits to the gym, evening training, skating sessions and a healthy diet for me. After a hard slog to start with (my body didnt know what had hit it!) I am now feeling great and cant wait to hit this challenge face on!! I hope I can make it round and raise soemmoney for a worthwhile cause.